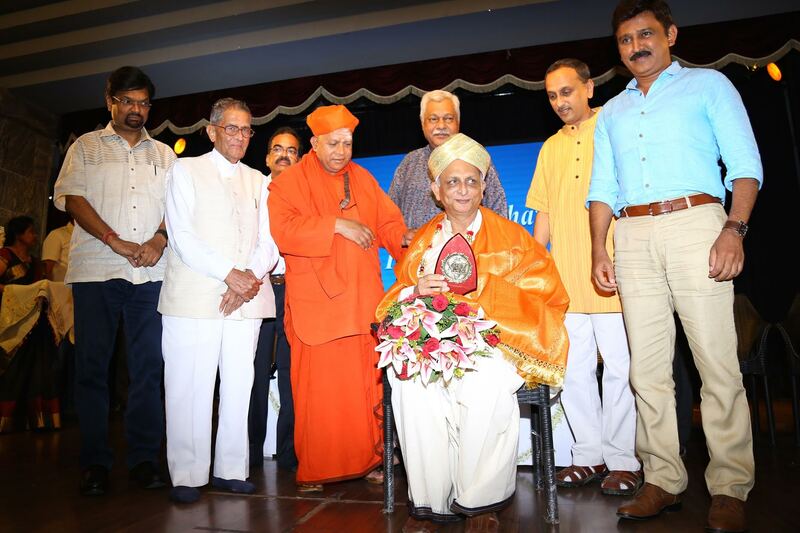 Bengaluru, May 21, 2016: A galaxy of dignitaries felicitated Sri M on the successful completion of the Walk of Hope 2015-’16 at a heart-warming function organized by the BhartiyaVidyaBhavanat the Khincha Hall within its precincts in the city this evening. 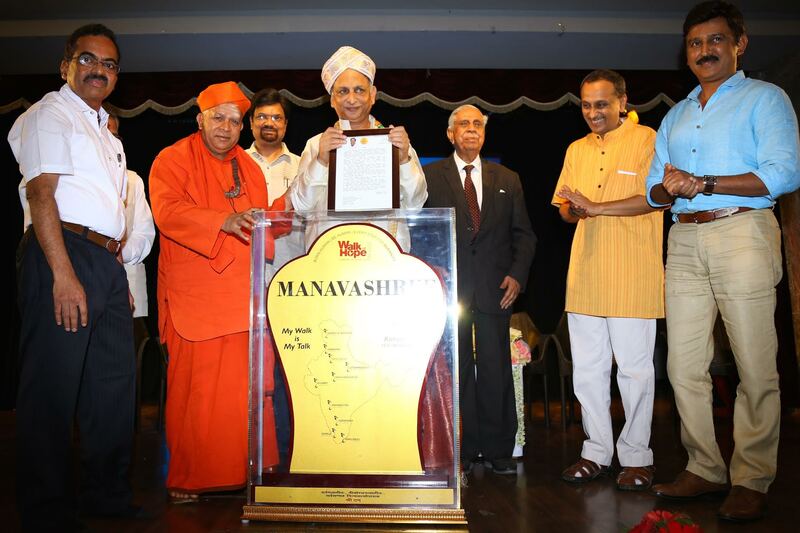 Chief Guest His Holiness Dr. Shivamurthy Shivacharya Mahaswamiji of the Taralabalu MahaSansthan, Sringere, Former Chief Justice of India, Sri M N Venkatachaliah, who presided over the ceremony, Guests of Honour,Sri M V Rajashekhar, Former Union Minister& Trustee, Loka Shikshana Trust, Sri Ramesh Arvind, renowned actor, Dr. Mahesh Joshi, Additional Director General, Doordarshan, Sri H N Suresh, Executive Director Bhartiya Vidya Bhavan, Sri Ashok Kamath, Chairman Akshara Foundation and ShriUmesh Bhatt, Chairman Loka Shikshana Trust, were among the distinguished invitees. 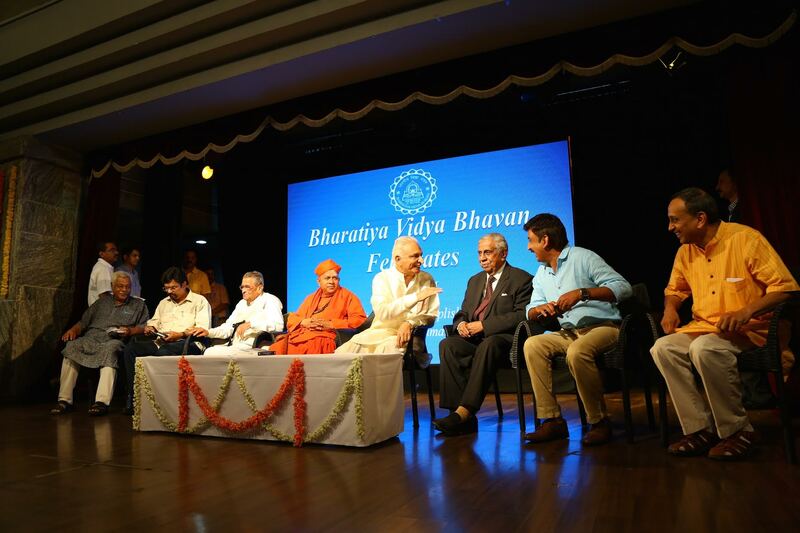 The ceremony began with a Kannada documentary on the Walk of Hope in Karnataka. Welcoming the illustrious guests, Shri H N Suresh said, “after seeing the film and the depiction of the work done, it is apt to say that there are a very few people who walk their talk; it is very difficult and most of them do not even attempt to walk their talk, but Sri M has made even the politicians walk. 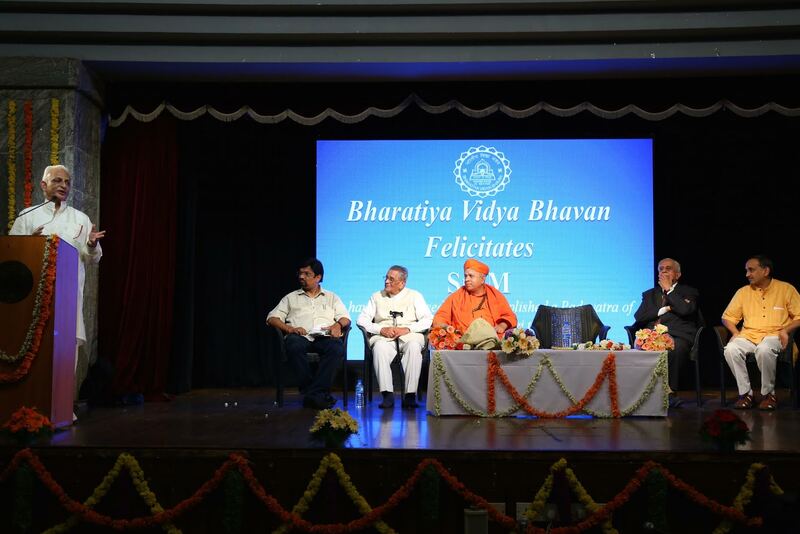 This, in my belief, has not done by anyone before.” He said he felt it was a privilege that the platform of Bharatiya VidyaBhavan was being used for the purpose of the felicitation. 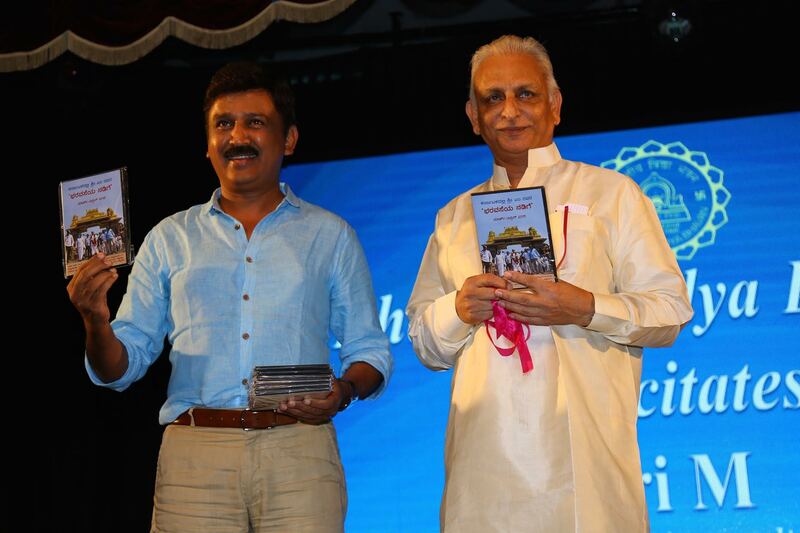 Renowned actor Sri Ramesh Aravind spoke next, narrating a story about how prejudice against each other was inculcated by two communities among their children, but the walls between them came crashing down once the children happened to interact with each other. “So we should be careful about the stories we tell our youngsters and now we have one lovely story to tell them – here is a man who walked from Kanyakumari to Kashmir to bring the communities together”, he said. These are the kind of the stories, you tell your children so that this world becomes a better place to live in, he added. “Forget the physical strain, forget the blisters on his feet, forget the painkillers he would have taken, but the thought behind the whole thing, the wonderful thought behind the whole thing, about this great human being walking all across the country to spread the message of a blossoming brotherhood – not a broken brotherhood. That is the message; that is the story that we carry. Thank you for the story Sir,”he said. Sri M. V. Rajashekharan said, “Last year, on January 12th, 2015, Sri M began a very special walk called the Walk of Hope and on 29th of April this year, he completed 7500 km of this walk. Today, more than at any other time, we require such people, such visionary leaders who bring different religious denominations together, kindling the hope of peace, brotherhood and harmony”. Dr. Mahesh Joshi from Doordarshan, said, “Whenever I think of Kabir I am reminded of Sri M. I am also reminded of a song written by Kabir ‘Moko Kahan Dhoonde re Bande, Main toh tere paas mein’; meaning where are you searching for me O Man, I am very close to you. ‘Na tirth mein’ I am not present in holy places of pilgrimage ‘Na Murath Mein, Na ekaant mein’ I am not in idols nor in solitude. ‘Na mandir mein Na Masjid Mein’- Not in a temple,nor in a mosque. 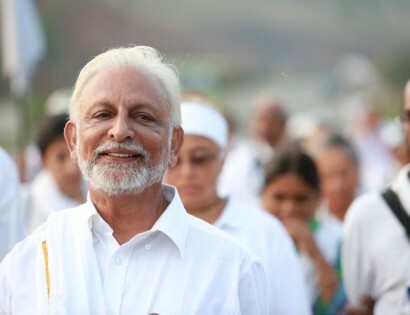 ‘Main toh hoon vishwasmein’ I am found in faith.”He said that the Walk of Hope was conducted with the same faith and it was this faith that had led him to become a follower of Sri M.
Sri Ashok Kamath said Sri M’s vision for the Walk of Hope needed to be amplified many more times over the next few years, so that all sections of society could work together to leave the world a better place than they found it. He compared the Walk to Mahatma Gandhi’s Dandi March and said it was an outstanding first vehicle to build an inclusive society. He spoke of how the walk had started off with a very small budget and how support came pouring in as they made their way forward due to his Guru’s Grace. 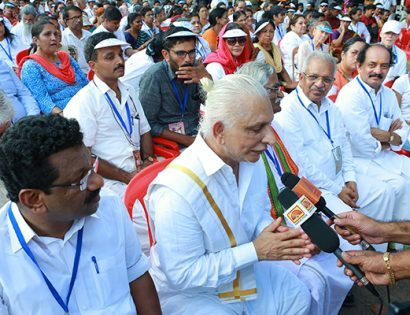 He also spoke of other obstacles along the way, including states where the Governments insisted that their armed commandoes walk along, despite his insistence on it being a padayatra for peace. “So this was the walk and it took us to so many states, eleven states, 16 months, 500 days almost,” he said. He said the essence of his talks everywhere was this: “There is no country in the world, which has 26 languages, 150 dialects, so many religions and among them so many sampradayas and yet generally, this is the impression I got after meeting 15-20 lakh people, we still think we are one. So that is the uniqueness of the country that with so many streams flowing into the ocean of manavekta – we are one. But there are fissures here and there. Things break when you feel sad, your heart breaks when you see people saying I belong to this religion and you belong to that religion so we are different. “So this was a walk, not so much of a cure, but a prevention. It was a preventive walk. We said lets find an inoculation by which at least the future generations are safe,” he said. In terms of the follow up, he said, the walk had just begun. He mentioned that in another one and a half to two years, another walk would probably traverse the Northeastern parts of the country. “This was from K to K – Kanyakumari to Kashmir and I am convinced that it did have some effects,that at least we have sown the seeds of harmony. Now the seeds that have been sown have to be nurtured. That nurturing is not in my hands it is in your hands,” he added. He pointed out that he could do the walk at the age of 68 because his mind was young and he bore no enmity to anybody. He also attributed this to practicing Yoga regularly since the age of 10 and having a controlled diet. “Be kind to people. Kindness and having no enmity towards others actually increases your strength and energy,” he said. He concluded by once again thanking everyone and saying each and everyone who participated in the walk, including those who could not physically participate but encouraged the walk with their minds, were responsible for its success. He specially thanked all the coordinators and Dr. Venkataraman who had organized an ambulance, medicines, driver and staff from BGS Hospital right from Kanyakumari to Kashmir. “I did not expect so many people will come and felicitate me… I just walked,” he concluded simply. Dr. Venkataramana then proposed a brief vote of thanks, bringing the function to a close. “Thank you very much. Namaskar, Sat Sri Akal, Salaam. The city of gardens is proud to present the “Manavashree” Award to Mumtaz Ali—popularly known as Sri M—who has successfully completed the Walk Of Hope 2015-16. 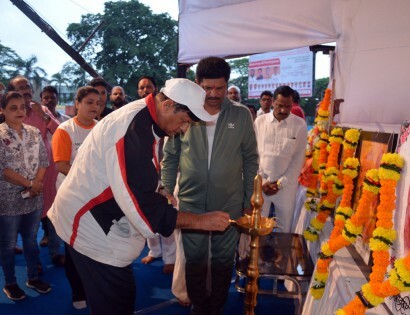 Walk of Hope is a 7500 km padayatra organized by the Manav Ekta Mission from Kanyakumari to Kashmir – covering 11 states of the Indian Subcontinent over 474 days. The Founder of Manav Ekta Mission, Sri M, started the padayatra for peace and communal harmony from Zero Point in Kanyakumar, Tamilnadu on the 12 January 2015 and concluded it in Srinagar, Jammu & Kashmir on 29 April 2016. Couple of months back, two events reported in the media influenced my mind. In the first event, a wild bear which wandered from the forest into the human settlement area was brutally killed by people with sticks and sickles and whatever they could lay their hands on. It was an incident in which men behaved like animals. In the second event, a thirsty elephant was quenching its thirst on the banks of a lake situated in Chamarajanagar forest area. A tiger, also thirsty, came and drank water next to the elephant and retreated quietly after it finished drinking. In this instance, animals refrained from behaving like animals. Which of these two incidents depict intolerance? It is a beautiful example clearly depicting who follows the rules of tolerance. Why is the level of humanity depleting in humans? The time when one human used to look at another as human is gently easing its way out. In this background, Sri M is affectionately beckoning to all of us—to understand and return to the ocean of love intrinsic to humankind. The need for such a visionary is a must for humanity. We all know that walking is excellent for our physical health. Sri M has proved that this is also the best endeavour to protect community health. We offer him our humblest salutations and wish him all the very best.